Posted on May 19, 2016 at 5:45 am. THIS week 32Red Casino is giving you the chance to boost your winnings, with $10,000 to giveaway as part of the Slots MAYhem promotion. This exciting offer gives you the power to control the size of your bonus, awarding you a percentage of the $10K prize pool depending on the percentage you wager on the pokies between the 17th and 22nd May. Sign in at 32Red.com, or register for a new account to claim your free $10 bonus, with no deposit required. Make a real money deposit in AUD using a trusted payment method like credit card, debit card, Neteller, Skrill, POLi, Paysafecard or bank transfer. Go to the promotions section, head to the $10,000 Slots Mayhem offer and enter your username to opt-in – this is a vital step to ensuring your wagers go towards the prize pool. Start playing any of the Microgaming pokies on offer at 32Red for real money bets. Each spin you place will earn your way towards gaining a position on the leaderboard. Come Sunday the 22nd, all players appearing on the leaderboard will split the $10,000 prize pool, earning a percentage of the loot based on the percentage that your wagers contributed to overall play. The leaderboard is updated regularly, and you can check it anytime at the $10,000 Slots Mayhem promo page to check your position and see how much you stand to win. The bonus money will automatically be credited to your account at the end of the promo period, with all bonus money subject to a 30X wagering requirement before funds are able to be withdrawn. This offer is also restricted to one prize per household, so even if multiple people play at different computers, only one of you is eligible to claim the bonus money. Be mindful that you only have seven days to use the bonus money before the offer expires. 32Red recently underwent a facelift, resulting in a huge improvement to their instant-play casino. 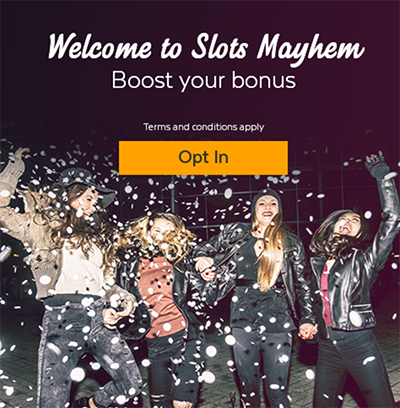 The Slots Mayhem promo provides a great excuse to try out the revived site, with plenty of new games to tackle including Win Sum Dim Sum, Bar Bar Black Sheep, Bikini Party, SunTide, Wild Orient, Dragon Dance and Peek-a-Boo. Head over to 32Red.com today and get spinning the reels to secure your place on the leaderboard and claim your portion of this $10,000 giveaway.